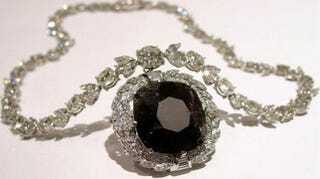 Black diamonds, also known as carbonados, are dark, porous, and found only in Brazil and Central Africa. And they don't come from volcanoes — they come from outer space. Carbonados don't look like much when they're first yanked out of the ground, but that doesn't differentiate them much from other diamonds. They're as hard as other diamond and polish up similarly to create lustrous jewelry. They're just a little different because they're extraterrestrials. While most diamonds on Earth are the result of carbon being crushed and heated beneath volcanoes, the porous black carbonados are meteorites formed during supernova explosions. The diamonds' locations were the first clue that led scientists to believe that carbonados are not homegrown. Although diamonds of every kind are found all over Earth, only Brazil and the Central African Republic are known to possess carbonado deposits. These two zones don't possess anything that other diamond-mining sites lack — these diamonds were produced by something other than the geology of the area. Two things caused carbonado researchers to look to space: nitrogen and hydrogen. The distribution of both elements in black diamonds was examined through infrared spectroscopy. Scientists heated the stones up and examined them with spectroscopes, which revealed that nitrogen was present in single atoms, not in aggregates like other gems. The scopes also revealed a lot of hydrogen layered on the stones. In sum, the spectroscopy resembled most closely the kind of emission and absorption spectra seen on meteors and in post-supernovae systems. These diamond offer a fascinating snapshot of the Earth's history. Sometime in the past, our planet came into contact with the detritus of a 2-to-3-billion-year-old supernova. A meteor of the surviving material drifted from the nova to earth, possibly in a chunk as much as a mile wide, broke up as it hit earth's atmosphere, and landed over South America and Africa. Those chunks of meteor were chewed into pieces by the earth and have been unearthed today as dark and unearthly crystals. And while it's true that we're all stardust, it's pretty insane to wear a chunk of multi-billion-year-old space stone on your hand. Image: Orloff Diamond. Via BNL, Arxiv, and IOP.